How do you want to complete your counseling? 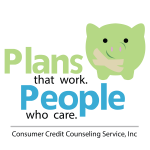 Consumer Credit Counseling Service, Inc. (CCCS) has over 32 years of experience educating consumers and clients about money and credit. Our counselors have completed the professional certification program with the National Foundation for Credit Counseling and are required to continue their education yearly to maintain this highly regarded certification. Our agency is a member of the National Foundation for Credit Counseling (NFCC). The NFCC has high standards for quality credit counseling and financial education, and our agency complies with those standards. In addition, our agency is certified by the Council on Accreditation, an independent third-party organization that reviews and monitors entities that provide social services. CCCS is a non-profit agency. We are organized and operate in accordance with Section 501(c)(3) of the Internal Revenue Code. CCCS receives funding in the form of grants from banks and other financial institutions that support financial counseling. We do not pay or receive fees or other considerations for referrals of debtor students to our agency. CCCS is obligated to provide your certificate promptly upon completion of counseling/briefing, and we will do this within one business day upon the completion of your course. You will only receive your certificate upon completion of counseling. The Executive Office for the United States Trustee (EOUST) may review client information as needed. The EOUST has only reviewed and approved Pre-filing credit counseling and Post-filing debtor education services. If you are taking this program online, the program will ask questions about your budget, assets, creditors and factors that led you to consider bankruptcy. There is a requirement by law that you must have interaction with your counselor in the counseling process. Your counselor will contact by phone to ask questions about the information you provided. Your counselor will discuss the factors/reasons leading you to why you are considering bankruptcy, and review your budget, creditors and assets. Your counselor will conduct an analysis of your financial situation, explore all alternatives to resolve your credit problems, and develop an individualized written action plan for dealing with your situation. The quality of your counseling session does not depend upon whether you decide to file for bankruptcy or not.